After excellent reception to the first score and mixed reception to the sequel, Tim Burton had left the directorial chores to Joel Shumacher who had replaced one of my least favorite composers, Danny Elfman, with one of my favorite composers, Elliot Goldenthal, who had previously gained notoriety for his controversial score for Alien3. Schumacher had asked Goldenthal to use Elfman's main theme from the previous two films, but the composer convinced him that the gothic tones of the previous films would not work the comic silliness of the latest flick in the series. The director agreed and a new Batman theme was born, and though not nearly as popular as the original, it sounds similar and is quite good. In keeping with his opinion of the comic book style of the movie, Goldenthal wrote his score to be as loud and silly as Elfman's were dark and gothic. The effect is quite mesmerizing, enchanting and sometimes nerve racking. My personal favorite sections of the score are the villain themes. Jim Carrey's character, the Riddler has a particularly zany theme heard in many forms in the single track, "Nygma Variations," but the true accomplishment of the album is the mad pounding waltz for Tommy Lee Jones' character the "Two-Face Three Step." Similar the Elfman's score for the first Batman film is the ending "Batterdammerung." It follows a huge build in orchestrations and brass power up to a fantastic conclusion. I appreciate this as a nice continuity between the entire series. Unfortunately this movie was plagued by a ridiculous boatload of horrid pop music, and as a result Goldenthal was unable to compose an end title, which would have created some much needed closure had it had a chance to exist. It's unfortunate movies like this that hurt the reception of film music. The entire score was around two hours long, but the album is rather short at just about forty-five minutes. Fortunately Goldenthal picked the best music from the entire score to be on the album. Though many people hate this score (which I'll never understand why), I love it, and I recommend it to everyone. Though people who seem to constantly dislike the work of Goldenthal will put this down with all of their abilities, I'd hope that most would see through the unwaranted detraction and enjoy such a wonderful soundtrack. 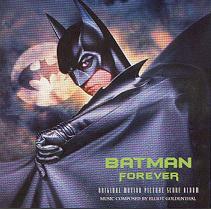 Batman Forever is copyright 1995 Atlantic Records. This review is written by and is the property of Isaac Engelhorn and does not reflect the opinions of Tripod.